These shelves normally fit in alcoves either side of a chimney breast. Alcove shelves are supplied approx 40mm longer to allow for variations in the width & angles of the alcove & must be trimmed to fit. The shelves are made shallower than the depth of the alcove so that the front of the shelf sits slightly back from the front of the chimney breast. If the shelf depth required is deeper than the chimney breast the shelves can be made to project slightly. We can fit the shelves into corners using two batttons rather than three so that the shelf is tringular in plan or rectangular (in which case we use wall shelf brackets at one end). These shelves can be fitted into narrow rooms or spaces such as above doorways (see photo above). We can also make them deeper and thicker so that they can function as a floating desk. Alcove Shelves can generally be fitted to just about any wall type including plasterboard provided the correct fixers are used (we supply red wall plugs which are generally suitable). We can produce alcove shelves in sections upto 2.4 metres long but spans supporting heavy loads will need extra support in the middle from our wall shelf brackets (in such cases the back wall will need to be solid). 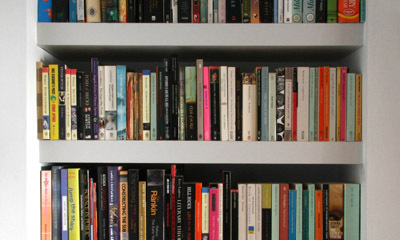 Alcove shelves are supported by battons at the back and sides. The shelves slide onto the batton from the front so we need to ensure that there are no obstructions such as window frames which may obstruct fitting. The shelves are supplied longer than the width of the alcove and must be trimmed to fit each position. It is usually necessary to cut the shelf a few millimetres less that the width of the alcove & any gaps can be filled with decorators caulk which should be retouched to match the wall colour..